NOTE: While we're busy planning, please check out our 2018 details below to get an idea of what to expect in 2019! Discover one of Virginia's most legendary landscapes, Sharp Top Mountain, with one of the most legendary Virginians - Thomas Jefferson! 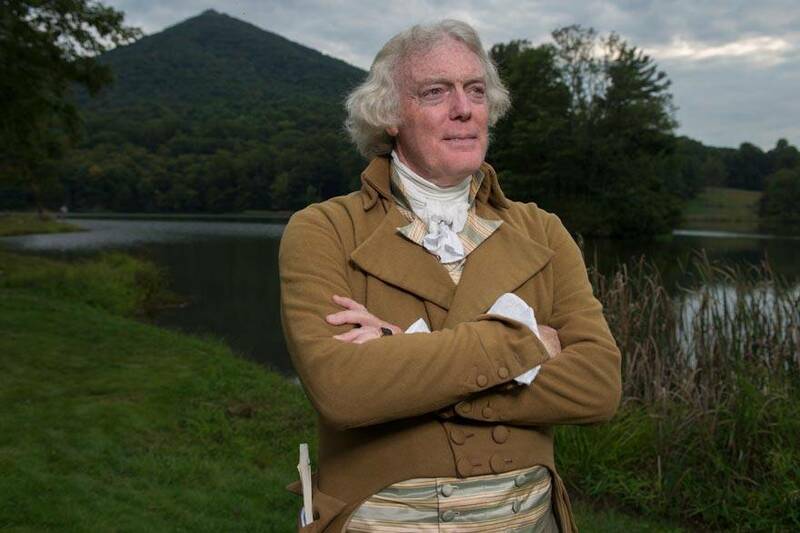 Through a partnership with the National Park Service and Poplar Forest, guests will join Mr. Jefferson as he provides his unique perspective on the cultural and natural histories that Sharp Top holds. Event begins at 5:00 PM on the lawn with scenic Abbott Lake and Sharp Top Mountain providing the background as guests are welcomed by NPS Ridge District Interpreter Ranger Peter Hamel and his staff. Following the welcome, Mr. Jefferson’s will do his “Chain Presentation.” Then guests will move inside to the Calvin Rice Room and hear from Jack Gary, the Director of Archaeology at Colonial Williamsburg who will speak in more detail about Jefferson’s 1815 hike of the Peaks of Otter to take measurements, his calculations and discovery. Dinner will follow with Mr. Jefferson. An overnight package will be available once event details are finalized. Prices subject to 5.3% State Tax and 4% Local Tax. Reservations are required; call 866-387-9905. Step back in time with one of the most legendary Virginians - Thomas Jefferson!